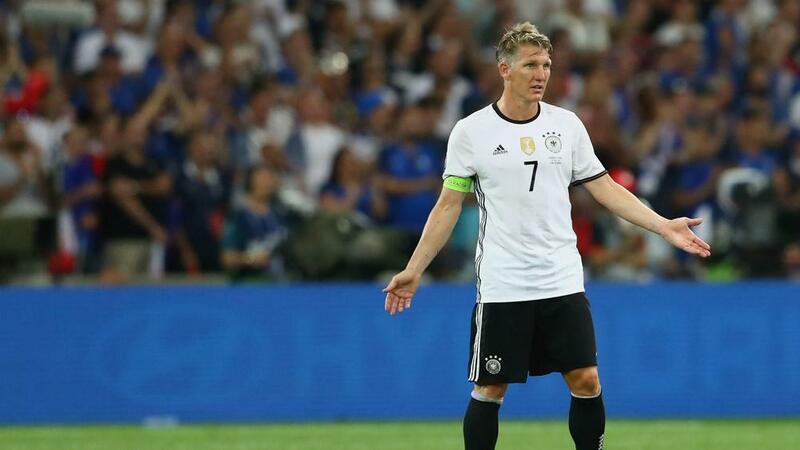 Michael Ballack has encouraged Germany captain Bastian Schweinsteiger to retire from international football. The Manchester United midfielder started just one game at Euro 2016 - the semi-final defeat to France - as he struggled to reach full fitness. And Ballack, his former team-mate, has reflected on a disappointing tournament for Schweinsteiger. "I think it is now a good time for him to withdraw," he wrote in his column for German publication Express. "I know that he is brutally ambitious. But if you have seen him in the last two years, you have to honestly say that I'm worried by his many injuries and about his physical condition. "He will now have enough to do, to prevail in Manchester in a great sporting competition. "Therefore, I do not know if he would do himself a favour by calling the World Cup in Russia his next personal goal. "I would advise him to think carefully about this step. "I'm afraid he might get into a vortex. Other players could use the situation to put his status in the team in question. "Schweinsteiger would not deserve that."